Dr Glen Calderhead the Guru of Low Level LED Light Therapy (LLLT) responds to Dr Emma Wedgeworth who’s recent post on Instagram advocates topicals in favour of light treatments. “It is not uncommon to disbelieve or discount as ineffective treatments that one cannot understand, and there is a great deal of misunderstanding regarding the appropriate use of light to treat active inflammatory acne, one of the facets of low level light therapy, or LLLT. This is clear in the post from Dr Emma Wedgeworth, who advocated topicals in favour of light in the treatment of acne, particularly moderate to severe acne. I would point anyone not clear about the real benefits of LLLT for acne towards two excellent papers written in reputable peer-reviewed journals just over 10 years ago which showed very clearly the real efficacy of a particular LLLT regiment. Incidentally, a search for “LLLT” in PubMed will get well over 5,000 hits, so it’s a seriously researched field with many proven benefits. The regimen used in both these papers was the same. Blue light-emitting diodes (LEDs) at 415 nm were applied in the first session, followed two days later by red 633 nm LED treatment. This was repeated for 4 weeks, and then followed up for 3 months. The reduction in acne lesions was recorded, and at the end of the 8th treatment session (4 weeks) had reached 50% in the Goldberg paper and 60% in the Lee paper. 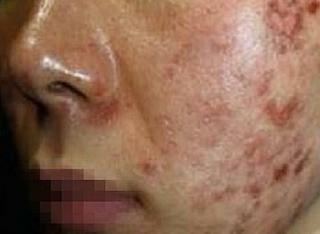 It should be noted that the patients in the Lee paper had more severe acne than those in the Goldberg paper. With no further treatment apart from washing with hypoallergenic soap, the improvement rates continued, much to the surprise of the researchers and the delight of the subjects, reaching over 80% on average at the three-month assessment. The science behind the treatment is well-proven. Blue light at 415 nm targets a compound called porphyrins, a photosensitizer which is found endogenously in active Propionibacterium acnes (P. acnes), the causative bacterium of inflammatory acne, The more severe the acne, the more porphyrins are found in P. acnes. 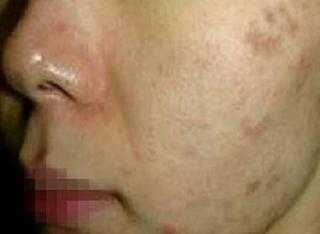 When activated, porphyrins induce singlet oxygen production within the P. acnes, a powerful free radical, which sends the affected P. acnes into programmed cell death, or apoptosis. This reduces the inflammatory load on the skin. Then the subsequent application of red light at 633 nm, which has more recently been replaced with deeper-penetrating and more efficient near-infrared light at 830 nm, finishes the job by removing the remainder of the inflammation, activating the macrophage cells to tidy up the damaged skin matrix, and the wound left by the acne lesions is also repaired, thereby helping to prevent scar formation. Neither LED wavelength is as effective on its own, and when used in the order given above, the synergy is very high. OLAT Technology provides concentrated output with less scattering for improved treatments. Without OLAT technology, energy is diffused and scattered. Optical Lens Array Technology (OLAT) uses collimation optics which more effectively harness and deliver the healing energy of 1800 new generation LEDs to achieve concentrated therapeutic photon intensities in the cells and organelles of the target tissue, thus maximizing the therapeutic outcome. OLAT improves the efficiency and enhances the efficacy of LED phototherapy. These studies cited above were light-only studies. If appropriate topicals are added to the LLLT approach, the effect can be even better and longer lasting, but care must be taken not to use any compound which photosensitises the skin.